Out of all the current mainstream manufacturers, it's Panasonic who seem to be struggling most to keep up with the competition. We recently looked at the Panasonic X300 and X700 models and found them to be lacking in specifications and poorly conceived from a product point of view. 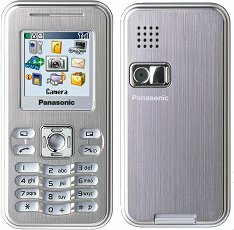 However, Panasonic have shown a determined effort to try to improve their product range with mixed results. These are very pretty phones, certainly. And they're very lightweight and slim - in fact we'd go so far and say these are some of the most attractive looking phones on the market, but in technical terms they are hugely disappointing. Screens are limited to 128x128 pixels, the best camera resolution is 640x480 pixels and there's no Bluetooth to be seen anywhere. Panasonic must be hoping that good looks will gloss over poor technical features - ironically, it's quite possible that this approach might work. 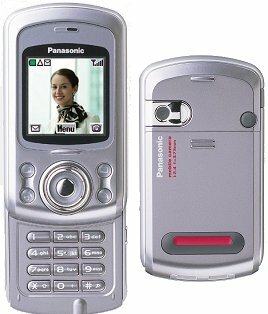 However, many commentators have stated plainly that Panasonic's product range shows very little real effort and is extremely uncompetitive - the speculation is, how long can Panasonic stay in this particular market with this type of handset? 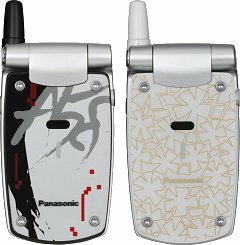 The Panasonic "A" class are ultra-lightweight phones, and the A500 falls easily into this class. The A500 is only 19mm thick, which is very thin for a clamshell, and it weighs only 86 grams. Inside is a 128x128 pixel display in 65,000 colours, Java and polyphonic ringtones. The covers are interchangeable and the A500 also features "one touch auto-open". There's no external display on the A500, and frankly the specifications are a little on the low site. An slimline camera phone, the Panasonic X100 is just 18mm thick and weighs just 79 grams. There's a 128x128 pixel display in 65,000 colours and a low resolution 320x240 pixel camera that frankly is not going to be much use for anything. There's a WAP browser and GPRS support but no Java. There's no doubting that this is an attractive phone, but the feature set is very disappointing. Panasonic are trading heavily on their new phones being small and lightweight. In the case of the X200, the phone is an incredible 12.9mm thick and weighs just 89 grams. Other than that, we seem the same bog-standard 128x128 pixel display but at least this time there's a VGA resolution camera. GPRS, Java and some PIM functions add to the features of this attractive but technically dull phone. A smart, slimline clamshell at just 17.5 mm thick and weighing just 86 grams, the looks on the X400 are pretty stunning. However, inside we've got the same old 128x128 pixel screen and 640x480 pixel camera as in the X200. There's Java support for games, pretty flashing LEDs (like the X60), one push auto open and some PIM functionality too. 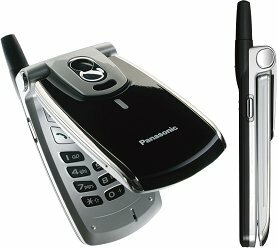 A sliding phone clearly inspired by the classic Siemens SL55, the Panasonic X500 is probably closer in spirit the tiny Siemens than the new Siemens replacement, weighing just 90 grams and measuring 81x46x22mm. There's a VGA resolution camera, GPRS, that 128x128 pixel display, Java and PIM functionality too. The feature set is strictly limited, but in this type of phone that's less of a problem.